We all know that we should consume our grains as whole grains. We’ve been hearing that for years. While finding whole grain products, even 100% whole grain, is fairly easy these days, for most of us, whole grain is equivalent with whole wheat. Some people say wheat is what is making people fat. In the book Wheat Belly:…by William Davis, he notices that the wheat we eat these days is not the wheat our ancestors ate. He also decides it is the consuming of this wheat that is making people fat. While I believe it is moderation that is key to keeping us healthy, I do believe we, as a population, have come to rely too heavily on wheat as our whole grain. Not to mention all the extra ingredients added to those whole wheat products. So what do we do? That’s what is available at the store. One thing I have done over the last six months is to put more oats into our diets. Steel cut oatmeal — my picky kid’s favorite breakfast. Great texture, minimally processed. This one takes a while to make, but so worth it. We like it with maple syrup, cinnamon, raisins and nuts. Certain foods like cinnamon and nuts help control insulin levels. 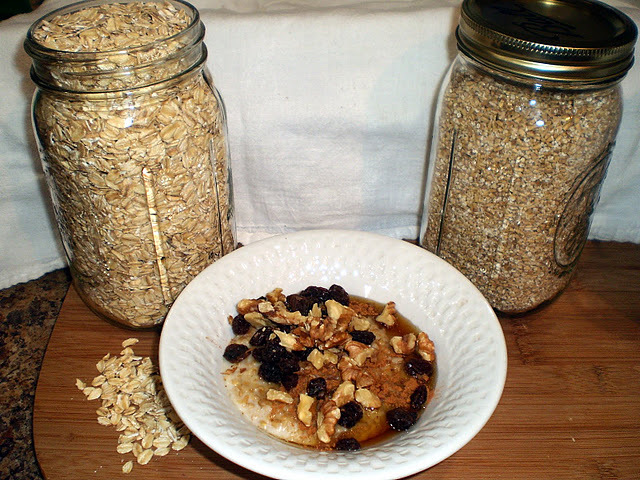 Add some oats to your diet not only for variety and all the health benefits they provide, but also because they are delicious! This entry was posted in Uncategorized and tagged biscuit, breakfast, cake, casseroles, dessert, granola, meatloaf, muffin, oat, oat flour, oats, wheat, whole grain by hshaut. Bookmark the permalink.